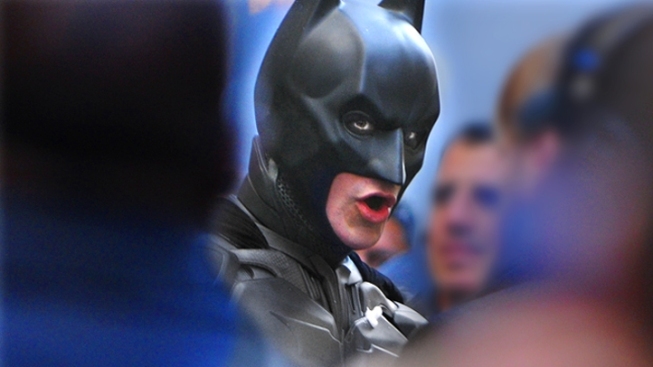 Theatrical trailer for latest Batman flick wins top honors at ceremony honoring those who entice audiences. "Chant," the first official trailer for "The Dark Knight Rises" took top honors at the Golden Trailer Awards in Los Angeles. The first official trailer for “The Dark Knight Rises” was awarded the top prize of Best in Show and also took the trophy for Best Summer 2012 Blockbuster at the Golden Trailer Awards held Thursday night in Los Angeles. The third and final installment of director Christopher Nolan’s dark interpretation of the caped crusader does not hit theaters until July 20, but the winning trailer (titled “Chant” from Warner Bros. and Open Road Entertainment) has kept audiences salivating for more ever since it debuted in December. The Golden Trailer Awards recognize the creative people who make the promotional materials for movies – from 30-second television spots to the posters that adorn billboards and childhood bedrooms. Other winners on the night included “Bridesmaids” which took Best Comedy, “Snow White and the Huntsman” earning Best Summer 2012 Blockbuster TV Spot, “The Hunger Games” grabbed the Best Action Poster gong and “Piranha 3DD” swam away with the award for Trashiest trailer. View all the winning trailers.